Baby boomers may dominate the demographic landscape in the country as a whole, but here in this city of learning and discovery, young people in their 20s are at the hub of life. They make up 23 percent of Boston's population, a higher concentration than in most comparably sized cities across the country, and twice the concentration of twentysomethings in Massachusetts. They are natives or newcomers, flooding Boston for college and jobs, coloring the city's complexion dramatically. They live in Boston for reasons as diverse as their interests. For Filiz Soyak , 26, an up-and-coming artist living and painting in the Fort Point artists' community, Boston's advantage is the way so much culture and diversity is packed into the relatively small area it occupies. "It's a city, but it's not huge, it's not overwhelming," she said. "Boston's a little slow, yet it has so many cultures, so many neighborhoods, and everything has its own personality." Others are attracted by the city's liberal attitudes. Freddy Franklin , 25, an actor, singer, and performing drag queen, calls the cultural landscape "very diverse, personality-wise." "I feel like I'm from the Bible belt, and I find Boston to be such a liberal and amazing city," said Franklin, who grew up in Wisconsin and was a football star in high school. "And I really think it's allowed me to grow into who I am, sitting before you now." 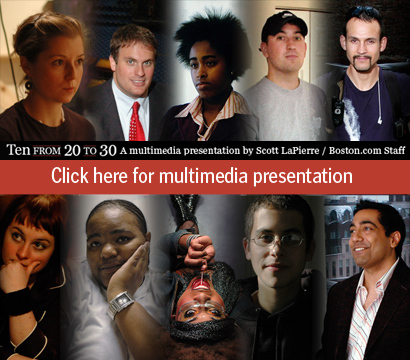 Click above for some of the stories of the twentysomethings who help define Boston.